If the PTA isn’t terrorizing parents about bake sales, what does the organization really do? Texas PTA‘s official mission is to make every child’s potential a reality by engaging and empowering families and communities to advocate for all children. At Vaughn Elementary in Frisco, where my kids attend, the PTA has been a partner with the school since it first opened for the 2016-2017 school year. And I can tell you from personal experience, it’s not all bulletin boards and spirit wear. 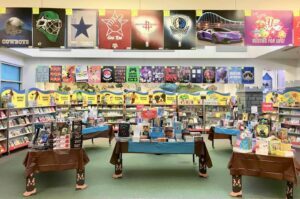 It’s organizing book fairs, supporting teachers and staff, building the Guided Reading library, purchasing technology for classrooms, and communicating with families through newsletters and social media. Its hosting programs such as Watch D.O.G.S., Reflections, and the Green Team, and bringing in educational speakers such as Dinosaur George. Fun Runs, Teacher Appreciation, and more. It’s any number of things that might enrich the learning experience of the students. PTAs throughout Frisco ISD are working diligently to offer students and faculty the same kinds of benefits and opportunities on their campuses. And yes, fundraising pays for many of these activities, which leads to the misconception fundraising is all that a PTA does. But studies show when families are involved in their children’s learning both at home and at school, their children do better in school. Joining PTA is a great opportunity to became an educational partner for your child(ren), participate in hands-on programs that are available from the partnership between the school and the PTA, keep up-to-date on exciting school events happening throughout the year, and network with community partners as a resource for current or future endeavors. Focusing on student and family engagement is a priority for President of Frisco ISD Council of PTA’s Melinda Samberson. While she was President of Cobb Middle School’s PTA, they become the first Frisco PTA to earn the National PTA School of Excellence and then the first PTA in Texas to win the Phoebe Apperson Hearst Outstanding Family-School Partnership Award. This year we’re encouraging our local PTAs to start the process to become a National PTA School of Excellence. The School of Excellence program encourages family-school partnerships and leads to enriching the educational experience and overall well-being for all students. When the school staff and parents come together to make their school better, excellence occurs. It’s wonderful to see many of our locals working toward family engagement alongside their school staff. Our district and community will be better through this family and school partnership! Successful schools build successful communities and the PTA is truly a partnership with each local campus to help continue to broaden this goal for our District. To learn more about how you can get involved with your PTA, visit the Frisco Council of PTAs. No bake sale experience necessary.